Top Chef Masters: "Masters Get Schooled"
Hello, and welcome to the bizarre world Top Chef—or as Bravo has labeled it, Top Chef Masters. You’ll find that it looks a lot like Top Chef—what with the spooky remix of the opening credits score, the Quickfire and Elimination Challenges, and at least the promise of Gail Simmons appearing as a judge at some point—but everything is a little bit off. The host, Kelly Choi, doesn’t appear like the sort to hike up her skirt to make way for a Carl’s Jr. burger, and the other judges (Gael Greene, James Oseland, Jay Rayner) all appear to be informed, experience critics and tastemakers who aren’t interested in stretching for that canned Toby Young bon mot. The contestants—all professional, established, awards-trumpeting executive chefs—are a thoroughly collegial lot, not given to the backbiting of ambitious but unproven novices in the culinary world. To put it bluntly then, Top Chef Masters is Top Chef without the drama. If that sounds like a harsh assessment, I actually don’t mean it to be. The main reason I’ve always favored Top Chef over other reality shows is that it’s a meritocracy; personality clashes, however entertaining they might be, have no bearing on the end result, which is all about the food that make it onto the plate. In fact, my least favorite Top Chef season, Season Two, was also the most contentious; I felt the drama sparked by Marcel, Ilan, and company were ultimately an annoying distraction from what appeared to be a lot of mediocre-seeming dishes. So I imagine Top Chef Masters will appeal to the wonkiest food nerds among us; others can stay tuned to The Real Housewives Of Long Island, or whatever it is that Bravo is running in heavy rotation these days. Just to be clear about the parameters of this “culinary clash of the titans,” it features 24 big-time chefs battling it out over 10 episodes: The first six will be like tonight’s hour, pitting four chefs at a time against each other, with the winner advancing to the “Champion’s Round” and earning $10,000 for their favorite charity. The remaining four episodes will presumably play out like the endgame of a normal Top Chef season, until the winner comes away with $100,000 in charity cash. And based on Hubert Keller’s triumphant performance, I’m guessing the homestretch is going to feature some pretty astonishing cooking. • The judges are pulling their punches. The 24 chefs who signed onto the show have reputations to uphold—and besides, they’re playing for charity, not $100,000 in seed money for their theoretical restaurants. Though I thought the judges overall did a fine job suggesting more subtly which dishes worked and which didn’t, you would never hear a qualifier like “If you consider the fact that it was cooked on a hot plate…” on Top Chef. And I don’t expect anything close to Anthony Bourdain-like colorful rancor. 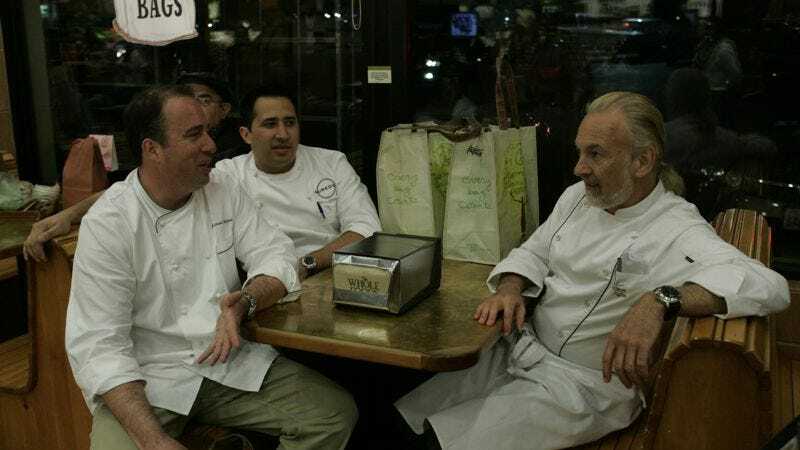 • The first six episodes stand to be awfully repetitious: Same show, different people, and very little opportunity to get to know those chefs that haven’t already cameoed on Top Chef in the past. 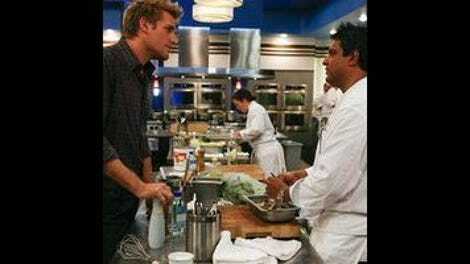 With all those caveats out of the way, I thought the inaugural episode got Top Chef Masters off to an excellent start. Both challenges were tremendous fun. The Quickfire, which tasked the foursome (Michael Schlow, Christopher Lee, Tim Love, and Hubert Keller) with cooking a dreaded dessert in 60 minutes, would have been fun enough even before they discovered their “judges” were a table full of Junior Girl Scouts. Remembering the deadened palates of kiddie tables past, it was a pleasant surprise to see the girls bring the hammer down on some of the weaker efforts. One redhead was particularly brutal, turning her nose up at Schlow’s overabundance of chocolate sauce, Love’s chicken-fried strawberry (“a little too soft”), and the slightly burnt bananas atop Lee’s French toast. And right from the start, the magnificent Hubert Keller threw down the gauntlet with whimsical dessert animals that lost nothing in the taste department. The Elimination challenge was as inspired a conceit as anything I can remember on Top Chef proper, sending the four to a college campus where they not only have to work with the tools of a dorm-rat (toaster oven, microwave, hot plate), but also within the cramped confines an actual dorm room. There was one notable rookie mistake—the overmatched Love stores his food overnight in a freezer instead of a refrigerator, which is especially disastrous for produce—but again, it was Keller who worked his magic in unforgettable fashion. Taking his cues from Cosmo Kramer, Keller brought the pasta for his mac-and-cheese dish into the shower for the straining process. Inventive as hell and yeah, a little gross, too. • More Keller: Opinions varied slightly on his pea and carrot soup with cinnamon, but the man certainly has a flair for presentation. Those homemade croutons looked great and given my belief that cinnamon is an underused and underrated spice, I’m inclined to think well of that dish.